These polyvinylchloride constructed cards are a common choice for ID badges industry-wide. Compatible with all PVC card printers. Designed specifically for use with our ID Maker® systems. Attach it to your existing proximity card to add a photo component and reduce frequent badge reprints as personnel change. Choose from a variety of cards to fit your access control needs. Need help? 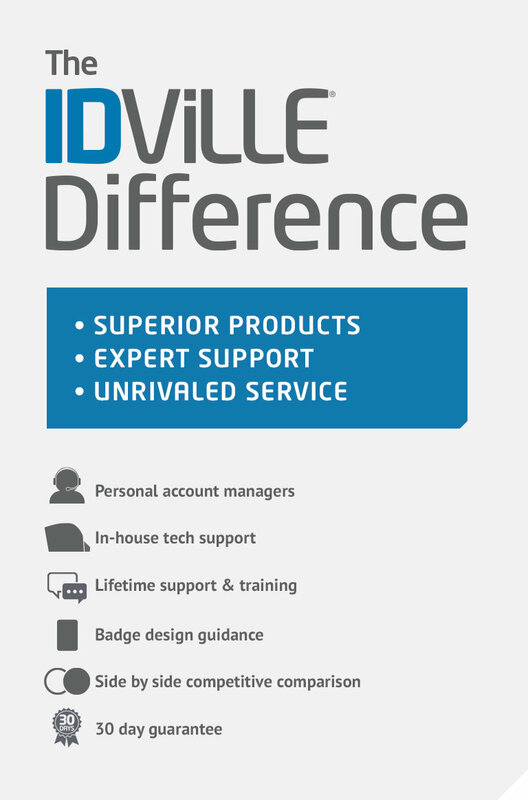 Chat live with an IDville expert to select the best card, for answers to your ID system questions or to request a free custom ID sample. PVC card measures 3 3/8" x 2 1/8"
We used these cards to adhere to our existing security badges. They were a perfect fit. You can save on the cost of New HID Prox Cards and reuse old ones by placing the PVC with adhesive on them. These really stick well to the HID cards but you can get them apart to reuse again in the future. I highly recommend this. We purchased the cards for use with our proxy cards. We have had no issues, they stick great, and go through the badge printer well, unlike the thinner cards that seem to get stuck in badge printer. You had what our company needed-Thanks! For photos on our key cards and it work Great. We print ID photo using the ID Maker to Adhesive Plastic Card then attach them to the ProxCard II, It work GREAT! Our company is very satisfied with this product. We have not experienced any peeling with this product. We use these for our ID Cards using the IDMaker to print and reel badge hold them. All of these product work and look GREAT. We use these cards to add photos to our existing access badges. They print easily and adhere well to the existing cards. This is the only badge front that I have purchased which works consisitently with our printer. Tried other brands and had jamming problems and other issues. I used this to add to my HID Prox cards. Much cheaper than having to buy the printable prox cards. It prints wonderfully on my Zebra printer. We use the adhesive mylar back badges exclusively, with the exception of visitor badges. It is important to adhere them fairly exactly to the card to prevent the corners from peeling away from the card, but when positioned straight to the card, they have lasted very long. Once you figure out the easiest way to peel off the mylar backing, it works great, allowing you to reuse expense prox cards.